This is one of my favorite stir-fry recipes to make during the week. It calls for a higher ratio of meat than is frequently found in Chinese recipes. Serves 3 - 4 as a main dish. Cut the beef across the grain into thin slices about 2 inches long. Place the beef in a bowl and add the marinade ingredients one at time, mixing in well and adding the cornstarch last. Marinate the beef for 25 minutes. Combine the oyster sauce, dark soy sauce, and water in a small bowl. Rinse the bamboo shoots in warm water to remove any tinny taste and drain. Finely chop the garlic. Cut the bell pepper in half and remove the seeds. Cut into thin strips. Clean the green onions and slice on the diagonal into thirds. Heat the wok over medium-high to high heat. Add 1 1/2 tablespoons oil. When the oil is hot, add half the garlic. Stir-fry until aromatic (about 10 seconds), and add half the beef. 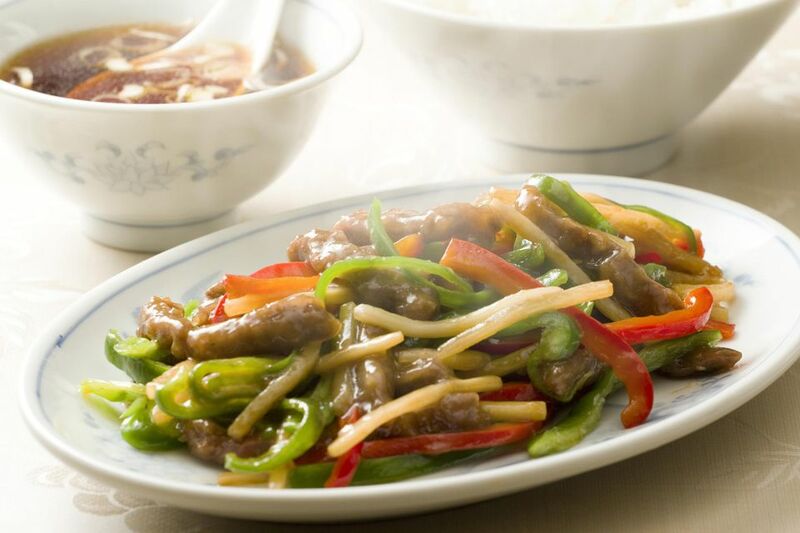 Let the beef brown and then stir-fry at high heat until the beef is about 80 percent cooked. Remove from the wok and cook the remainder of the beef. Add a small amount of rice wine or sherry to the beef while cooking if desired. Wipe out the wok and add 1 tablespoon oil. When the oil is hot, add the remainder of the garlic. Stir-fry for 10 seconds and add the green pepper. Stir-fry for a minute and then add the bamboo shoots. Splash a bit of water, soy sauce or chicken broth on the vegetables if they begin to dry out while stir-frying. (Total time for stir-frying the vegetables should be about 2 minutes). Add the sauce to the wok and bring to a boil. Add the cooked beef and the green onion back into the wok. Stir-fry for another minute to mix everything together.